StreamDev: Low-Cost Hydroinformatic Sensing Platform for Improved Water Resources Management is a collaboration between researchers at UC Merced, Kathmandu University, and the International Centre for Mountain Development (ICIMOD), and ultimately will lead to the integration of hydrologic knowledge and socioeconomic information into a water management decision support system capable of evaluating water management alternatives in planning best response strategies to periods of water abundance (i.e., flooding) and scarcity (i.e., drought) given rapid hydroclimatic change. Data is needed to answer questions about how much water is available and/or used, when, where, by whom, and for what purpose. This is a central problem in sustaining water resources for human uses and environmental needs. Integrated Water Resources Management (IWRM) aims to understand hydrology for effective decision-making in planning related to conservation, water supply, and flood risk; however, data needed for IWRM often require expensive sensors. 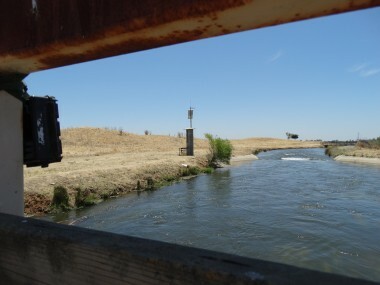 The StreamLapse approach estimates water fluxes based on field-calibrated imagery and machine learning techniques. If physical dimensions of channels and flows are known from imagery, we can infer flows at other points in time from the imagery alone. These data in turn can be used to validate hydrological models and regional remote sensing efforts. In parternship with Kathmandu University, we propose a streamlined StreamLapse system for implementation in Nepal. Nepal is an ideal implementation country as it faces IWRM challenges related to climate change, conservation planning, flood risk, hydropower and environmental flows and houses a USAID/NASA SERVIR data hub with relevant scientific capabilities housed in ICIMOD. At a future time, this data can be included in a more robust decision support system that focuses on upstream-downstream linkages from ecosystem services to livelihoods. During the initial implementation phases, the team successfully deployed a series of flow monitoring systems in the Roshi River, a one-hour jeep ride away from Kathmandu University (KU) in Dhulikhel, Nepal. The team’s partners at Kathmandu University are now the stewards of the stream monitoring tools, a Masters student is incorporating results from our monitoring systems into both his graduate thesis and work for the local water development authority, and University of California-based team is currently developing curriculum on topics such as machine learning and geospatial modeling for Kathmandu University partners. The team has also established a partnership with ICIMOD, the leading research institute in the country with an interest in water resources planning and management, and began collaborating with Professor Mark Aldenderfer, Dean of the School of Social Sciences, Humanities, and Arts at UC Merced, and National Geographic Explorer who has a long history of working in Nepal.